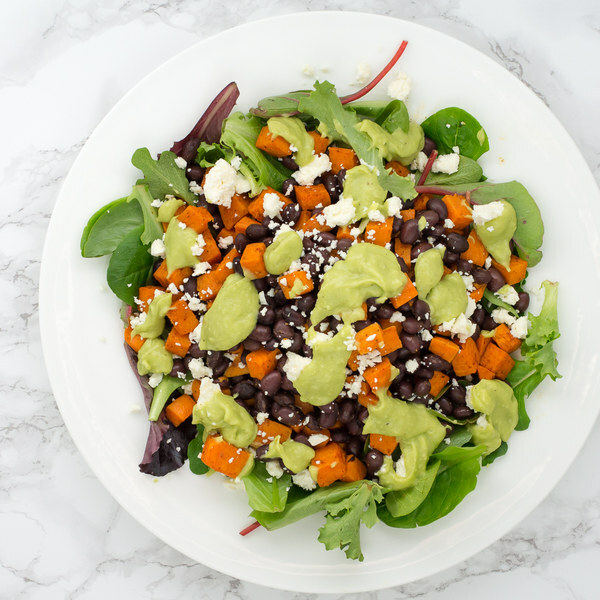 ← Sweet Potato & Black Bean Salad with Avocado Dressing & Feta. Peel and medium dice the sweet potatoes into ½-inch cubes; transfer to a medium bowl. Drizzle the potatoes with olive oil and season with chili powder, cumin, salt, and pepper; toss to coat. Transfer the mixture to a sheet pan and spread out in a single layer. Place the potatoes in the oven and roast, tossing once halfway through cooking time, until the potatoes are tender and lightly browned, 15 to 20 minutes. Drain and rinse the beans in a colander; set aside to drain further. Scoop out the avocado flesh and transfer to a medium bowl; mash with a fork until smooth. Trim off and discard the root end of the garlic; peel and mince or press the garlic. Add to the bowl with the mashed avocado. Juice the lime and add to the bowl. Add olive oil, salt, and pepper to the bowl; mix the dressing until well combined. Alternatively, use a hand blender to make a very smooth dressing. Place the feta in a small bowl. Using a knife, shave the cilantro leaves off the stems at a downward angle, working away from your body; discard the stems and finely chop the leaves. Transfer to a large salad bowl. Add the sweet potatoes and beans to the salad bowl; toss to combine. To serve, divide the mixed greens between dishes, top with the salad and feta, and drizzle with the dressing. Mix together and enjoy!